The Somy X5 is made by… Scny Eriosscn (a real jawbreaker, I know). It is a bit larger than the original but most probably you won’t notice the difference (while the Sony Ericsson XPERIA Pureness measures 112 x 43 x 13 mm, its clone stands at 115 x 50 x 14 mm). And here goes the really interesting part – the dual SIM phone Somy X5 packs a transparent monochrome screen just like the one of the original XPERIA. They have actually made somewhat larger at 2.2 inches but the resolution of 176 x 220 pixels is kept intact. You will be losing the scratch-resistant surface if you go for the clone but at least you will be getting a microSD card slot. The final difference between those two is the price. 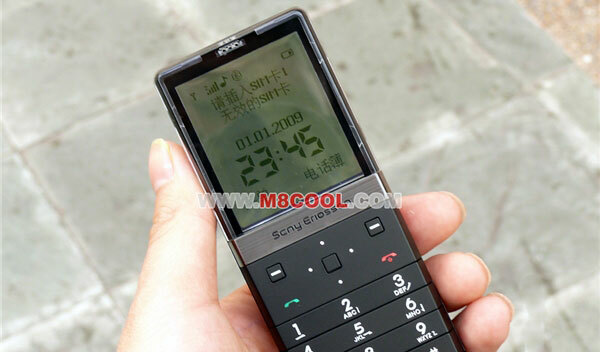 Currently, the original Sony Ericsson XPERIA Pureness costs good 900 US dollars (and that is if you’re lucky and manage to find it so cheap), while the clone retails 80 US dollars. However, don’t forget that the Somy X5 comes with only a 6-month warranty and no 24/7 concierge service. OK, warranty is important but who needs the concierge service? After all what is Google for?